We believe "ViAna-1" device to be the best offer in terms of "price - functionality" at the moment. The device allows measuring vibration with different parameters by using the in-built and external sensors. These measurements can be performed in the form of acceleration (A, m/s2), velocity (V, mm/s) and displacement (S, m). 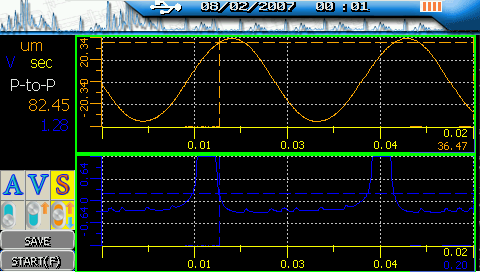 In the device screen the amplitude, RMS or peak-to-peak values of the measured vibration waveforms can be shown. Vibration measurements by the built-in sensor are performed in the standard frequency range from 10 to 1000 Hz. "VC-310A" external vibration sensor operates in the frequency range from 5 Hz to 5 kHz. The device has large memory capacity for data storage, so it can be used as a digital recorder. The duration of the non-stop vibration signal measurement is up to 10 hours. This mode is useful for analyzing non-stationary electro-mechanical processes in the rotating equipment, such as going up and rundown of rotors, assessing the impact of process parameters on the vibration magnitude. amplitude and phase correlations between different spectrum harmonics. 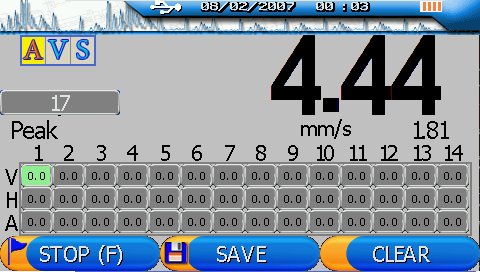 Spectrums can be calculated with very high frequency resolution up to 6400 lines. Such high frequency resolution is a feature of the best vibration monitoring devices, most of which are considerably more expensive than "ViAna-1" is. 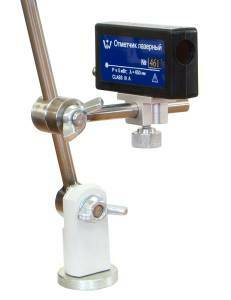 Using "ViAna-1" device it is possible to perform specialized works, known as rotating equipment adjustment by vibration. The most frequent is rotor balancing in their own bearings, i.e. without machine disassembling. For this purpose a laser tachometer probe is included into the standard "ViAna-1" device delivery set and there is firmware for one- and two-plane balancing. 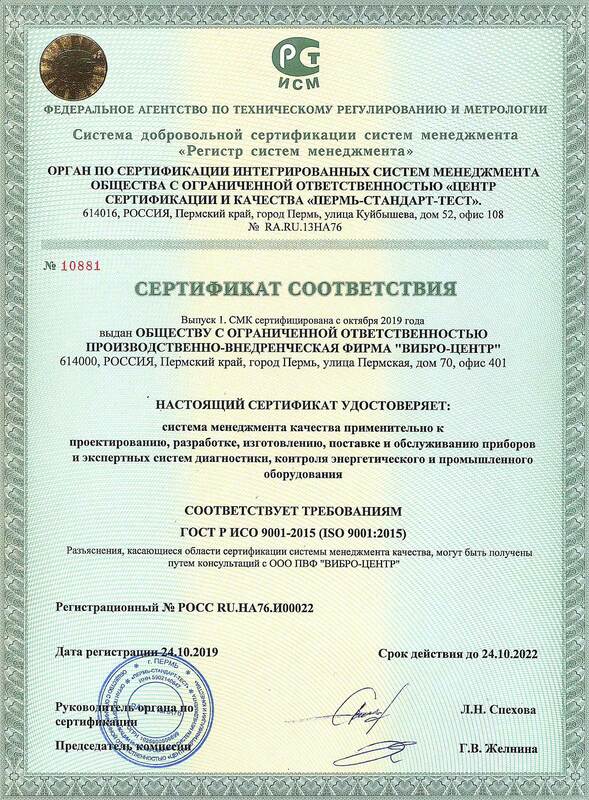 By the results of the test startups the device calculates the weight and the installation angle of the balancing masses to reduce the mechanism vibration. The balancing program is simple, so the device can be used by the staff with minimal training, eliminating up to 80 - 90% of all detected rotor imbalances. For evaluating the roller bearing condition "ViAna-1" analyzes and compares the overall level of vibration with the parameters of the shock pulses caused by the defects of the roller bearings. On the base of this analysis the conclusion on the roller bearing condition is given. The second diagnostic method of "ViAna-1" device is analyzing of "classical spectrums" of vibration waveforms, measured on the bearings. The vibrometer measuring mode gives quick assessment of the rotating equipment condition. For each measurement point we get only one value of the vibration RMS, and compare it to the vibration standard. These values can be stored and downloaded into "Aurora-2000" software, which assesses the equipment condition, reveals the possible causes of vibration, and allows predicting vibration changes and planning future repairs. "ViAna-1" device is cased in metal, the case is ergonomic. The device has got a large and bright color screen suitable for operating in extended temperature range and a membrane keyboard. The device has got two vibration sensors – an inbuilt one and an external one, connected by the cable. To charge the accumulators (three, AA size) a standard micro-USB connector is used. Instead of the accumulates ordinary non-rechargeable AA batteries can be used. "ViAna-1" device is supplied together with "Aurora 2000" and "Atlant" software. The latest versions of this software could always be free downloaded from our site. A multi-level database for classifying and storing of all the data measured on the monitored equipment. Software for data transformation into graphic form, which facilitates effective assessment of machine condition. An automated diagnostic system based on the standard diagnostic algorithms, as well as the algorithms developed by user. "Atlant" software for organizing periodic monitoring of rotating machines. 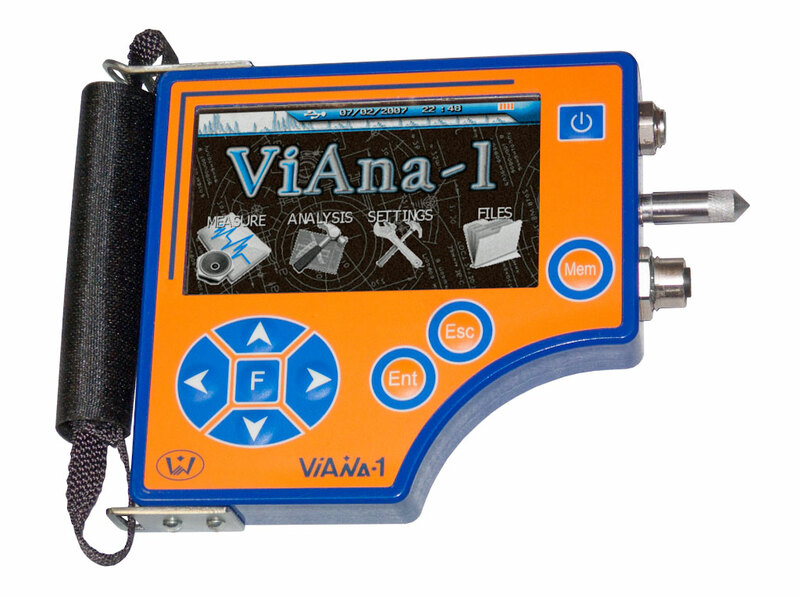 In "Atlant" software the routes for vibration parameter measurement are generated and downloaded into "ViAna-1" device. Probe for the inbuilt vibration sensor. Magnet for the external sensor installation. Cable for "VC-310A" sensor connection, 1,5 meters long. Cable for the laser tachometer probe, 1,5 meters long. The laser tachometer probe stand with a magnet. Reflective tape for the tachometer probe. USB cable for PC connection. CD with "Atlant" and "Aurora-2000".